If you spend your days moving around on the floor, then you know what a toll it takes on your knees. The problem isn't so much that you are on your knees all day, but that you have to get up and down to move around or crawl on all fours. I have found 3 possible solutions that aim to solve the problems of moving around on the floor, and they range in price from $55 - $150. All three options are probably a lot better than crawling around on your knees. I've been thinking about getting one of these for installing trim. Anything to make me more comfortable and faster on the job is worth it. If you already use one of these wheeled knee pads, be sure to let us know how it works out for you. 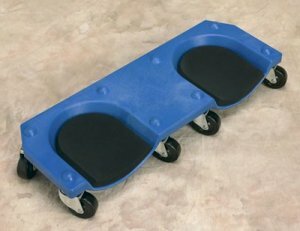 The first is from Bucket Dolly Inc. called Rolling Knee Pads and costs just under $80. It features 8 heavy duty swivel casters on a single base with two contoured knee pads and has a 300lb weight capacity. Next are the Knee Blades which cost around $55. These are two separate wheeled bases that feature 3 wheels on each base. A knee pad is used to secure the base to your knees. The entire pad is made of a gel material, and can easily be locked and unlocked from the roller base. The two-piece system is said to provide better balance and more control of movement. Last is the Racatac. It is the most expensive of the three at $150 and up. The Racatac allows you to work on both knees, but also keeps some of your body weight on a seat and off your heals. It is made of 1/8" aluminum and has five 2" or 3" casters. It also has room on board for a tool tray, so your tools won't be left behind. Shop around for the best price.